1 D None No Power Seat 1 D is a standard Business Class seat that transforms into an angled flat bed located at a bulkhead. The proximity to the galley and lavatory area might be bothersome. Floor storage for personal items is not available for use during take-off and landing. 1 G None No Power Seat 1 G is a standard Business Class seat that transforms into an angled flat bed located at a bulkhead. The proximity to the galley and lavatory area might be bothersome. Floor storage for personal items is not available for use during take-off and landing. 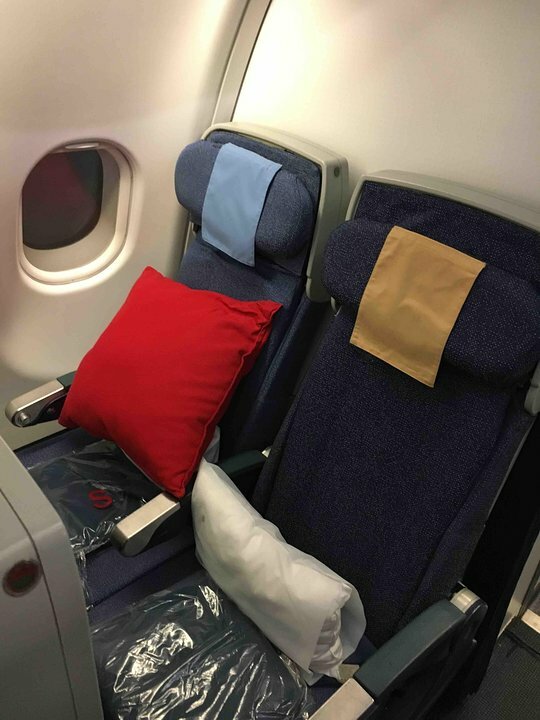 2 A None No Power Seat 2 A is a standard Business Class seat that transforms into an angled flat bed located at a bulkhead. The proximity to the galley and lavatory area might be bothersome. Floor storage for personal items is not available for use during take-off and landing. 2 C None No Power Seat 2 C is a standard Business Class seat that transforms into an angled flat bed located at a bulkhead. The proximity to the galley and lavatory area might be bothersome. Floor storage for personal items is not available for use during take-off and landing. 2 D None No Power Seat 2 D is a standard Business Class seat that transforms into an angled flat bed. 2 H None No Power Seat 2 H is a standard Business Class seat that transforms into an angled flat bed located at a bulkhead. The proximity to the galley and lavatory area might be bothersome. Floor storage for personal items is not available for use during take-off and landing. 2 K None No Power Seat 2 K is a standard Business Class seat that transforms into an angled flat bed located at a bulkhead. The proximity to the galley and lavatory area might be bothersome. Floor storage for personal items is not available for use during take-off and landing. 20 A None No Power Seat 20 A is a standard Economy Class seat located in an Exit Row. It features additional legroom due, however, the protrusion from the exit door might take away some of the extra room. The tray table and IFE monitor are installed in a fixed armrest, therefore, seat width is slightly reduced. Floor storage for personal items is not available for use during take-off and landing. 20 C None No Power Seat 20 C is a standard Economy Class seat located in an Exit Row. It features additional legroom. The tray table and IFE monitor are installed in a fixed armrest, therefore, seat width is slightly reduced. Floor storage for personal items is not available for use during take-off and landing. 20 D None No Power Seat 20 D is a standard Economy Class seat located in an Exit Row. It features additional legroom. The tray table and IFE monitor are installed in a fixed armrest, therefore, seat width is slightly reduced. Floor storage for personal items is not available for use during take-off and landing. 20 F None No Power Seat 20 F is a standard Economy Class seat located in an Exit Row. It features additional legroom. The tray table and IFE monitor are installed in a fixed armrest, therefore, seat width is slightly reduced. Floor storage for personal items is not available for use during take-off and landing. 20 G None No Power Seat 20 G is a standard Economy Class seat located in an Exit Row. It features additional legroom. The tray table and IFE monitor are installed in a fixed armrest, therefore, seat width is slightly reduced. Floor storage for personal items is not available for use during take-off and landing. 20 H None No Power Seat 20 H is a standard Economy Class seat located in an Exit Row. It features additional legroom. The tray table and IFE monitor are installed in a fixed armrest, therefore, seat width is slightly reduced. Floor storage for personal items is not available for use during take-off and landing. 20 K None No Power Seat 20 K is a standard Economy Class seat located in an Exit Row. It features additional legroom due, however, the protrusion from the exit door might take away some of the extra room. The tray table and IFE monitor are installed in a fixed armrest, therefore, seat width is slightly reduced. Floor storage for personal items is not available for use during take-off and landing. 21 D None No Power Seat 21 D is a standard Economy Class seat that is not aligned with the row in front. The alignment will affect underseat storage and legroom. The tray table and IFE monitor are installed in a fixed armrest, therefore, seat width is slightly reduced. 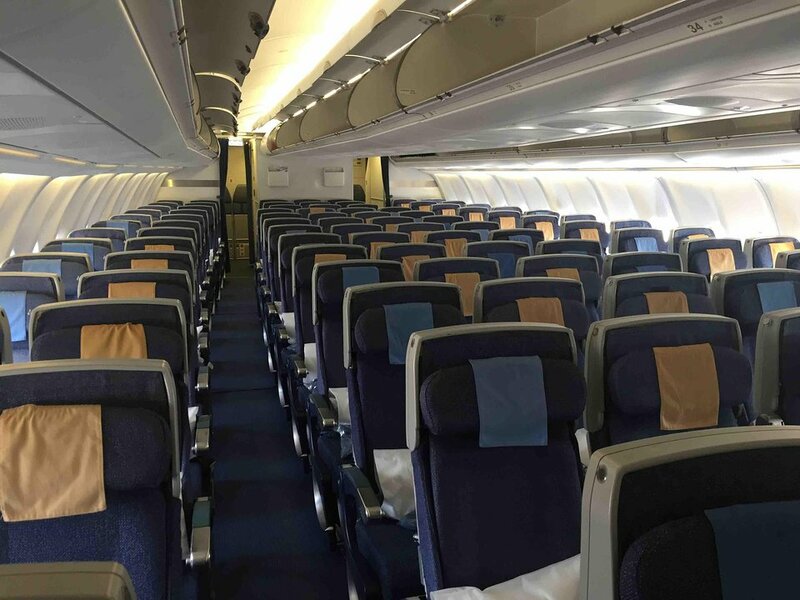 The seat also juts out into the aisle, therefore, it might be bumped by passengers and crew members passing. 21 E None No Power Seat 21 E is a standard Economy Class seat that is not aligned with the row in front. The alignment will affect underseat storage and legroom. The tray table and IFE monitor are installed in a fixed armrest, therefore, seat width is slightly reduced. 21 F None No Power Seat 21 F is a standard Economy Class seat that is not aligned with the row in front. The alignment will affect underseat storage and legroom. The tray table and IFE monitor are installed in a fixed armrest, therefore, seat width is slightly reduced. 21 G None No Power Seat 21 G is a standard Economy Class seat that is not aligned with the row in front. The alignment will affect underseat storage and legroom. The tray table and IFE monitor are installed in a fixed armrest, therefore, seat width is slightly reduced. 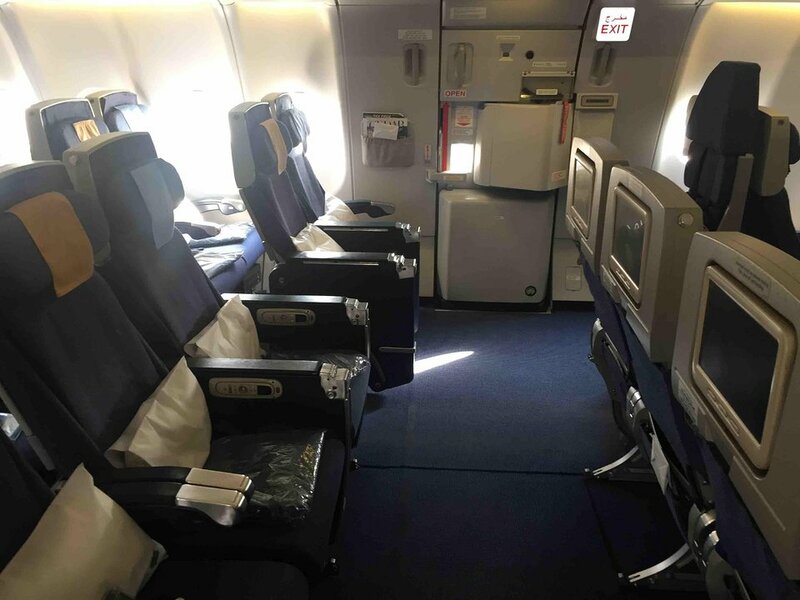 The seat also juts out into the aisle, therefore, it might be bumped by passengers and crew members passing. 3 C None No Power Seat 3 C is a standard Business Class seat that transforms into an angled flat bed. 3 D None No Power Seat 3 D is a standard Business Class seat that transforms into an angled flat bed. 3 H None No Power Seat 3 H is a standard Business Class seat that transforms into an angled flat bed. 3 K None No Power Seat 3 K is a standard Business Class seat that transforms into an angled flat bed. 31 A None No Power Seat 31 A is a standard Economy Class seat with limited recline due to the exit row behind. 31 C None No Power Seat 31 C is a standard Economy Class seat with limited recline due to the exit row behind. 31 H None No Power Seat 31 H is a standard Economy Class seat with limited recline due to the exit row behind. 31 K None No Power Seat 31 K is a standard Economy Class seat with limited recline due to the exit row behind. 33 A None No Power Seat 33 A is a standard Economy Class seat located in an Exit Row. It features additional legroom due, however, the protrusion from the exit door might take away some of the extra room. The tray table and IFE monitor are installed in a fixed armrest, therefore, seat width is slightly reduced. Floor storage for personal items is not available for use during take-off and landing. 33 C None No Power Seat 33 C is a standard Economy Class seat located in an Exit Row. It features additional legroom. 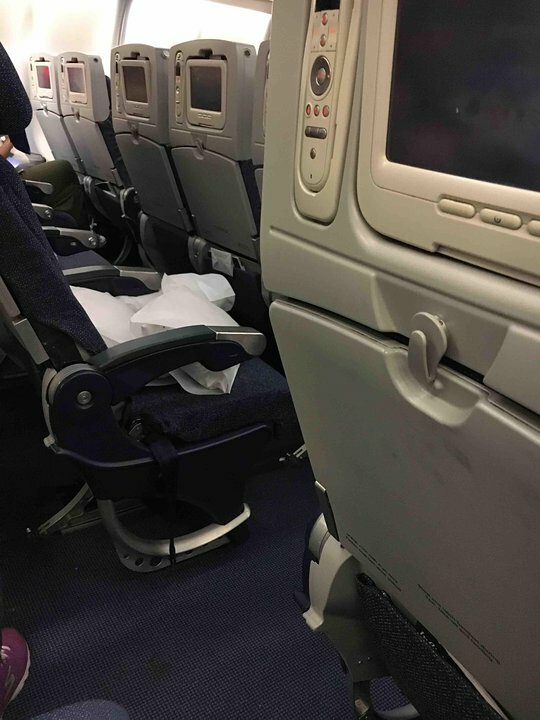 The tray table and IFE monitor are installed in a fixed armrest, therefore, seat width is slightly reduced. Floor storage for personal items is not available for use during take-off and landing. 33 H None No Power Seat 33 H is a standard Economy Class seat located in an Exit Row. It features additional legroom. The tray table and IFE monitor are installed in a fixed armrest, therefore, seat width is slightly reduced. Floor storage for personal items is not available for use during take-off and landing. 33 K None No Power Seat 33 K is a standard Economy Class seat located in an Exit Row. It features additional legroom due, however, the protrusion from the exit door might take away some of the extra room. The tray table and IFE monitor are installed in a fixed armrest, therefore, seat width is slightly reduced. Floor storage for personal items is not available for use during take-off and landing. 4 A None No Power Seat 4 A is a standard Business Class seat that transforms into an angled flat bed. 4 C None No Power Seat 4 C is a standard Business Class seat that transforms into an angled flat bed. 4 D None No Power Seat 4 D is a standard Business Class seat that transforms into an angled flat bed. 4 G None No Power Seat 4 G is a standard Business Class seat that transforms into an angled flat bed. 4 H None No Power Seat 4 H is a standard Business Class seat that transforms into an angled flat bed. 4 K None No Power Seat 4 K is a standard Business Class seat that transforms into an angled flat bed. 42 D None No Power Seat 42 D is a standard Economy Class seat. The seat back, due to aisle positioning, might be bumped by a passenger or crew member passing from the rear of the aircraft. 42 G None No Power Seat 42 G is a standard Economy Class seat. The seat back, due to aisle positioning, might be bumped by a passenger or crew member passing from the rear of the aircraft. 43 D None No Power Seat 43 D is a standard Economy Class seat that is not aligned with the row in front. The alignment will affect the IFE monitor, underseat storage, and legroom. The tray table is installed in a fixed armrest, therefore, seat width is slightly reduced. 43 F None No Power Seat 43 F is a standard Economy Class seat that is not aligned with the row in front. The alignment will affect the IFE monitor, underseat storage, and legroom. The tray table is installed in a fixed armrest, therefore, seat width is slightly reduced. 43 G None No Power Seat 43 G is a standard Economy Class seat that is not aligned with the row in front. The alignment will affect the IFE monitor, underseat storage, and legroom. The tray table is installed in a fixed armrest, therefore, seat width is slightly reduced. 44 D None No Power Seat 44 D is a standard Economy Class seat. The proximity to the galley and lavatory area might be bothersome. 44 G None No Power Seat 44 G is a standard Economy Class seat. The proximity to the galley and lavatory area might be bothersome. 45 A None No Power Seat 45 A is a standard Economy Class seat located in a last row of the aircraft. Seat back recline might be limited due to the wall of the lavatory directly behind. Also, if the seat back in front is reclined, then personal space will be reduced. The proximity to the galley and lavatory area might be bothersome. 45 C None No Power Seat 45 C is a standard Economy Class seat located in a last row of the aircraft. Seat back recline might be limited due to the wall of the lavatory directly behind. Also, if the seat back in front is reclined, then personal space will be reduced. The proximity to the galley and lavatory area might be bothersome. 45 D None No Power Seat 45 D is a standard Economy Class seat located in a last row of the aircraft. Seat back recline might be limited due to the wall of the lavatory directly behind. Also, if the seat back in front is reclined, then personal space will be reduced. The proximity to the galley and lavatory area might be bothersome. 45 F None No Power Seat 45 F is a standard Economy Class seat located in a last row of the aircraft. Seat back recline might be limited due to the wall of the lavatory directly behind. Also, if the seat back in front is reclined, then personal space will be reduced. The proximity to the galley and lavatory area might be bothersome. 45 G None No Power Seat 45 G is a standard Economy Class seat located in a last row of the aircraft. Seat back recline might be limited due to the wall of the lavatory directly behind. Also, if the seat back in front is reclined, then personal space will be reduced. The proximity to the galley and lavatory area might be bothersome. 45 H None No Power Seat 45 H is a standard Economy Class seat located in a last row of the aircraft. Seat back recline might be limited due to the wall of the lavatory directly behind. Also, if the seat back in front is reclined, then personal space will be reduced. The proximity to the galley and lavatory area might be bothersome. 45 K None No Power Seat 45 K is a standard Economy Class seat located in a last row of the aircraft. Seat back recline might be limited due to the wall of the lavatory directly behind. Also, if the seat back in front is reclined, then personal space will be reduced. The proximity to the galley and lavatory area might be bothersome. 5 A None No Power Seat 5 A is a standard Business Class seat that transforms into an angled flat bed. 5 C None No Power Seat 5 C is a standard Business Class seat that transforms into an angled flat bed. 5 D None No Power Seat 5 D is a standard Business Class seat that transforms into an angled flat bed. 5 G None No Power Seat 5 G is a standard Business Class seat that transforms into an angled flat bed. 5 H None No Power Seat 5 H is a standard Business Class seat that transforms into an angled flat bed. 5 K None No Power Seat 5 K is a standard Business Class seat that transforms into an angled flat bed. 6 A None No Power Seat 6 A is a standard Business Class seat that transforms into an angled flat bed. 6 C None No Power Seat 6 C is a standard Business Class seat that transforms into an angled flat bed. 6 D None No Power Seat 6 D is a standard Business Class seat that transforms into an angled flat bed. 6 G None No Power Seat 6 G is a standard Business Class seat that transforms into an angled flat bed. 6 H None No Power Seat 6 H is a standard Business Class seat that transforms into an angled flat bed. 6 K None No Power Seat 6 K is a standard Business Class seat that transforms into an angled flat bed. 7 A None No Power Seat 7 A is a standard Business Class seat that transforms into an angled flat bed. 7 C None No Power Seat 7 C is a standard Business Class seat that transforms into an angled flat bed. 7 D None No Power Seat 7 D is a standard Business Class seat that transforms into an angled flat bed. 7 G None No Power Seat 7 G is a standard Business Class seat that transforms into an angled flat bed. 7 H None No Power Seat 7 H is a standard Business Class seat that transforms into an angled flat bed. 7 K None No Power Seat 7 K is a standard Business Class seat that transforms into an angled flat bed. 8 A None No Power Seat 8 A is a standard Business Class seat that transforms into an angled flat bed. 8 C None No Power Seat 8 C is a standard Business Class seat that transforms into an angled flat bed. 8 D None No Power Seat 8 D is a standard Business Class seat that transforms into an angled flat bed. 8 G None No Power Seat 8 G is a standard Business Class seat that transforms into an angled flat bed. 8 H None No Power Seat 8 H is a standard Business Class seat that transforms into an angled flat bed. 8 K None No Power Seat 8 K is a standard Business Class seat that transforms into an angled flat bed. Music programming is available through the inflight entertainment monitors at all seats. Films, children's programming, and video games are available through the inflight entertainment monitors at all seats. AC power ports are available at all seats in Cedar Class. Middle East Airlines (ME) flies its Airbus A330-200 aircraft on long-haul routes. 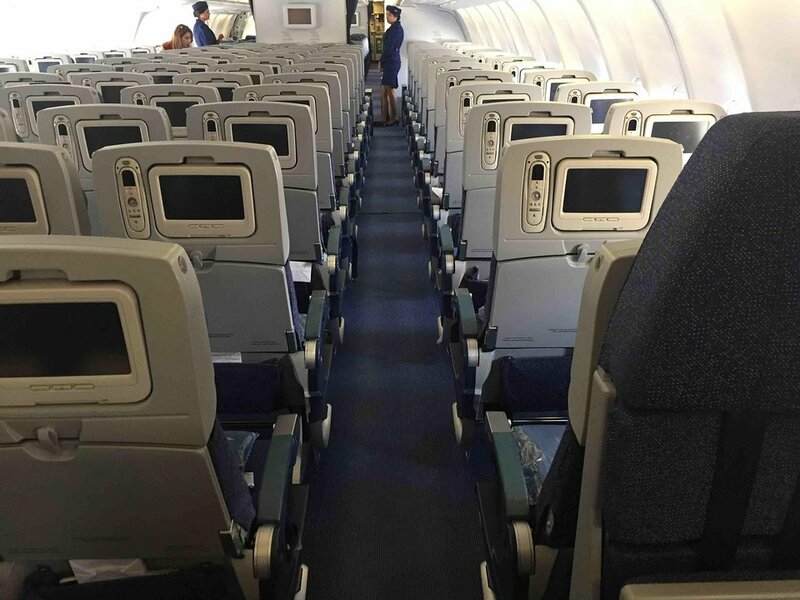 All of its A320-200 aircraft are configured with 44 Business Class seats that transform into angled flat beds in Cedar Class and 200 standard Economy Class seats. Horrible seat. It does not recline, but rather slides ahead a few cm. As a result your knees bump into the seat in front, and your chest into the tablet, if the latter is deployed. Impossible to get any rest. The smartaleck who invented this technology (and the airline executive who bought it) should be forced to take a daily flight under these conditions. This seat (and probably all in coach on this plane) should be yellow. On the other hand, the soft product (meal) is of excellent quality and quantity. Flew this A330 plane from London Heathrow to Beirut flight ME202. Seat 39A was comfortable, clean and had great legroom. Very good touch screens tvs at every seat with great movies, games, maps, info and tv shows like Friends. Flight attendants were young, full of energy and very friendly. Food was amazing. 5 Stars for MEA. This seat offers an amazing view of Beirut when you land from the North. One of the best flights of my life. Decent seat - Some planes have been upgraded so they have newer entertainment systems, although seat comfort is similar (good). I have taken this plane on the BEY-CDG route multiple times - I prefer MEA to Air France when flying economy as the seat is a bit wider (although AF business class is better). Not only that but on flights from BEY you get fresh knafeh which that is actually pretty good! Middle East Airlines flies 1 versions of Airbus A330-200.